I have control over how and when I work. I receive support and encouragement from my boss and co-workers. My work lends purpose and meaning to my life. Stress can help me learn and grow. I often perform better under stress. My job makes me feel hopeful about the future. Stress can be healthy and energizing. My boss doesn’t try to micromanage me or my work. I am treated fairly and without prejudice at work. People are basically stimulus seekers, each of us is trying to find an optimal level of stimulation, not too low or high. Trying to manage our arousal/stress levels is difficult because of their causal complexity and potential abundance. Images inside our heads to conditioning from distant childhood experiences to the immediacy of a bad boss can trigger stress. Each of us probably carries a unique set of events that set us off or accumulate to set us off. The General Adaptation Syndrome sets us up to FIGHT or FLEE, causing hard-wired effects difficult to manage in the contemporary environment. Human beings have spent thousands of years developing systems to assure we are rarely in life-threatening situations. People ask “Do we live in a more stressful world?” The answer is yes, here is why. Last week we discussed the Yerkes-Dodson law. This function shows that there is a personal optimal level of stress where each of us performs best. So why is stress such a problem in the modern world? We are perfectly adapted to surviving and that heritage bears little similarity to our current environments. In the hunter/gatherer world there were lots of life threatening events. The presence of such a threat, perhaps a sabre-tooth tiger, sets off an automatic emergency reaction, the major aspect being to dump tons of epinephrine (adrenaline) into our circulatory system preparing us to FIGHT or FLEE. This is called the General Adaptation Syndrome, as you can see, it’s a real gas. Unfortunately, virtually all contemporary stressors do not permit us to fight or flee, so we end up cooking in our adrenaline. Incidentally, I know people for whom the drug of choice is adrenaline. They are not fun to work with. These stressors are idiosyncratic; each of us has his/her own personal set. Some are common, most are not, some are powerful, most are not. 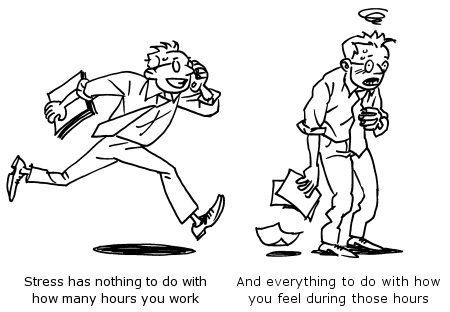 Please note, the accumulation of many smaller stressors can have big effects. My mother used to state “In life It’s not the elephants that get you, it’s the ants.” There are lots of “ants” in the modern environment. Many of these result from technology. Next week: assessing and managing your stress. ere are a couple of ways that people can subscribe to this blog. Click the “+ Follow” link on the bottom right section of the site and enter your email address. This is a very easy way to receive the newest post as an email. The other way is via RSS (Really Simple Syndication) feed. The RSS Feed link is located on the right sidebar of the site, directly above the Categories section. Click on “RSS – Posts” to receive your posts in their favorite RSS reader. The RSS reader that many prefer is Google Reader (http://reader.google.com). It is free, well organized, and easy to use. Welcome to the Yerkes-Dodson law. Since 1908 psychologists have known that this curve predicts performance under various states of arousal. Now days we call arousal STRESS. 1. Very low and high levels of stress produce poor performance; think a continuum from boredom to fear. 2. Every person’s curve is approximately the same, but where you are based on the arousal/stress curve is personal to your own physical and psychological constitution. Different people take less or more stress to move along the curve. 3. Everyone has an optimal level of stress during which his/her performance is markedly enhanced. 4. Within limits you can manage your stress level by increasing or decreasing the amount of internal (thoughts and feelings) and external stimulation (everything outside your skin – think “bad boss) you are receiving. There are a wide variety of ways to do this, from exercising to sleeping to mental imaging. Murdering your boss is not acceptable, but thinking about murdering him is OK. Remember, unless you speak, your thoughts are private. Next week: How this stress pattern evolved.